Total Safety Consulting is your source for a wide variety of construction safety services for your project in New York or New Jersey. We provide many services including training, compliance consulting, safety plans and programs, and safety professionals. We have worked on many complex projects in New York City and have knowledge of codes and regulations. Our team of certified professionals includes site safety managers, medical technicians, fire safety managers, and more. We can work with you to develop a site safety plan for specialized to manage the unique hazards on your construction site. Have a project? Give us a call! Specialized logistics and planning services are available and our proven process ensures every detail is covered. TSC provides comprehensive safety programs, plans and specifications and full AutoCad and Revit 3D modeling capabilities. In addition, TSC offers job hazard analysis, fire safety plans, and tenant protection plans among others. TSC provides onsite medical technicians through our team of medical professionals in conjunction with the medical direction of a board-certified physician. We can offer analyses of injury reports to identify trends and maintain comprehensive record keeping of all on-site safety and health issues. To further your goals for an injury free workplace TSC can develop and implement a comprehensive Drug Free and Alcohol Free Work Plan for clients. Because of the dense population and sheer magnitude of ongoing construction projects in New York City, working here presents unique safety challenges. We are a Certified WBE (Women Business Enterprise) by New York City, New York State, Port Authority of NY/NJ, and the School Construction Authority (SCA). We are the largest privately owned safety consulting firm in New York—planning to keep our city building. With its professional staff of nearly 300 safety professionals and support staff, TSC has unparalleled expertise in safety management and loss control engineering services making us uniquely qualified to respond to any situation. 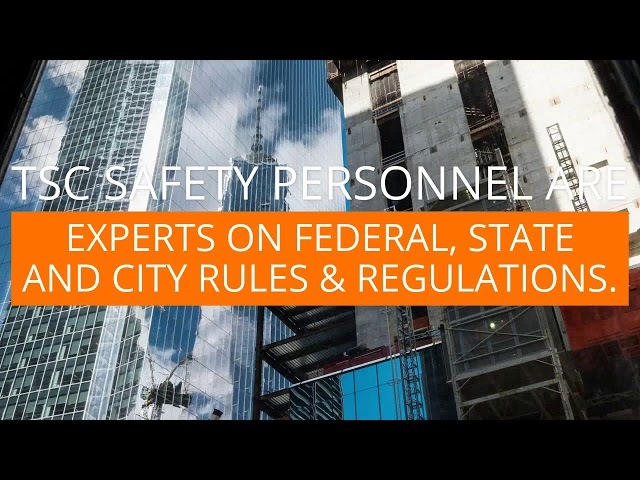 TSC’s staff of licensed safety professionals, technical consultants and trainers have expertise in all areas of regulatory compliance and occupational health and safety. Our staff members have specialized areas of competency in scaffolding, hoisting and rigging, cranes, environmental issues, fall protection, public safety, fire/life safety, and health and hospitals. Total Safety Consulting operates full-scale Training Centers in Long Island City, Manhattan and New Jersey. We train thousands of construction workers and Site Safety Managers to get the certifications they need and offer individualized trainings to clients upon request. Our experience in injury management can help clients develop and implement an effective return to work program that meets the needs of the field team as well as client’s insurance carriers. We also provide handpicked safety gear through our online store to make it easy to outfit your team. If you are planning a project in South Florida, our company, Total Safety Consulting Southeast (TSCSE), a turnkey provider of construction safety solutions specializing in the fabrication and installation of temporary and comprehensive jobsite protection packages. Have a question? A new project? To learn more about the site safety services we provide or are interested in working with Total Safety, contact us today.